I couldn’t fit the entire image in the frame, but I am showing most of it. The chopmark and the signature is as positioned correctly, I believe, although the picture had been hanging vertically. I don;t know if it is something of value or just decorative. Serious investigation would be needed to determine if it is genuine. 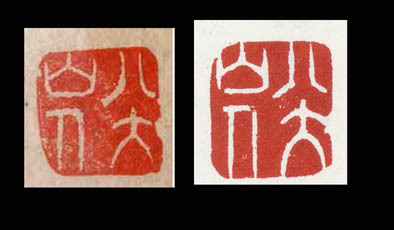 The signature and seal read 八大山人. The seal is correct, and BaDa did occasionally add that fifth character to his signature. Though hard to tell from the photographs, this could be a reproduction, possibly woodblock from a studio such as RongBaoZhai in Beijing. or the similar studio in Tianjin. If genuine, this would probably be classified as a significant cultural treasure by the Chinese Government. Perhaps one of you could tell me how to go one step further in authenticating this or perhaps even how I determine the age of it. Would there be something else embossed in the paper such as a watermark maybe? are close, but it is a facsimile of the original.